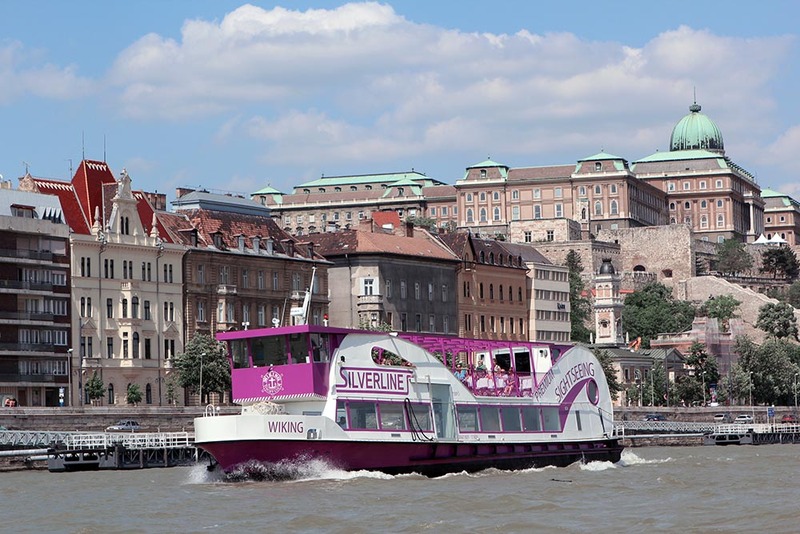 Taking a river cruise is a special way of making a sightseeing tour and in the heart of Europe, in Budapest, this is extremely valid. Namely, one of the most significant rivers of Europe called the Danube separates Buda and Pest from each other, giving an opportunity for visiting the city from a new perspective. 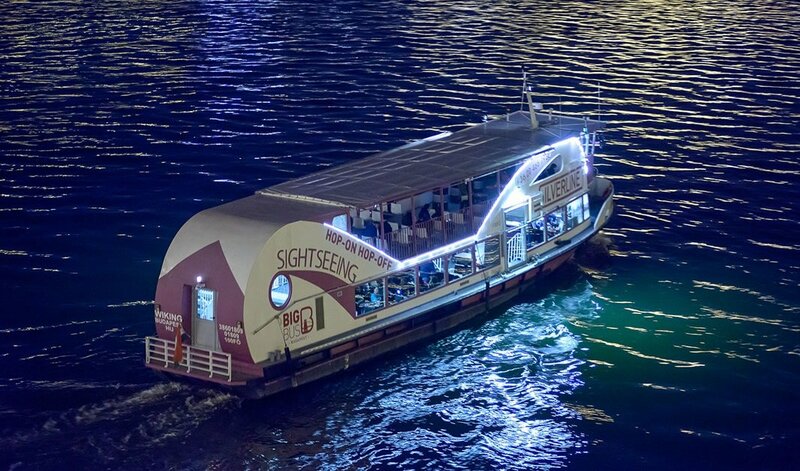 Moreover, our sightseeing cruises and river dinner cruises offer their programs daily for those, who are interested in discovering Budapest and want to admire the beauty of its sight from afloat the river. However, we also have an opportunity for those who want to explore all of this in an intimate atmosphere and share it only with friends or with the family members in a private tour, or perhaps want to rent a proper boat for a special occasion to give a unique scene as the event’s background. Are you looking for a venue and you have chosen to rent a boat as a special way of celebration, an unusual view, a moving venue to impress your guest? We are delighted to offer you our fleet, which has been proven to be an extraordinary experience for people when it is about a special occasion. 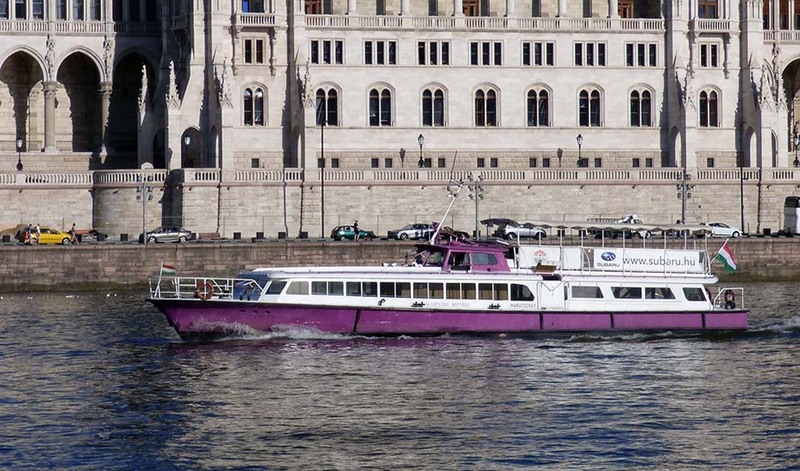 Our boats are available for rent with a captain and - based on the size - with a crew, even within the city or outside from Budapest along the river as well. We help you to plan your possible route, if needed the stopping places, the place of departure and even if it is different from it, the place of arrival. All of our cruises are under testing and inspection continuously to meet technical requirements. We offer boat rentals from 1 to 250 people, thanks to our wild selection of vehicles. The rout of the rented boat can be within Budapest and in unpopulated areas as well based on the request. As needed the boat stays in the dock. The location of departure and the location of arrival can be different and be changed after consultation. Our event and cruise ships include closed and open-air terraces allowing you to take advantage of the good weather conditions and enjoy the fresh air and sunshine or hide inside according to capricious weather. The indoor spaces of our ships are well equipped with air conditioner and heating system allowing us to create a pleasant interior atmosphere according to any weather. There are, of course, many reasons why someone wants to celebrate on a boat, arrange a meeting there or just want to be separated from the noisy city. We have assembled some popular events for which we strongly recommend renting boats because they can enhance the already increased atmosphere and even make the event unforgettable. Boat wedding, wedding themes on water? Are you interested in shipping and would like to celebrate your wedding day or any related moment of the wedding on the water? With our package we put together, we will be happy to assist you in implementing any of this events, should it be from the marriage proposal until the brunch after the wedding. You can choose one of the options mentioned above or even create a package for yourself in which case we offer you discounted services to make that special day even more joyful. 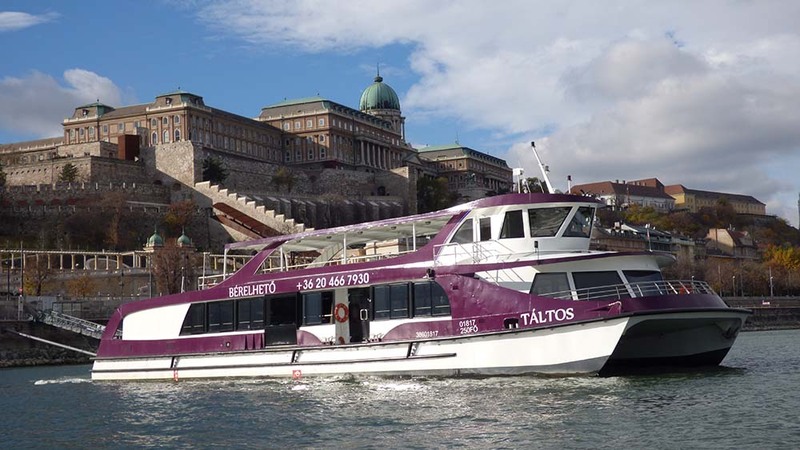 With the maximum capacity of 250 people (lower level 150 persons, the top level 100 people) we especially recommend it for larger and more elegant events if you are looking for private boat rental in Budapest. This self-designed catamaran is unique since the special structure of the body proves a more stable location on the water with fewer fluctuations than the average boat shape. 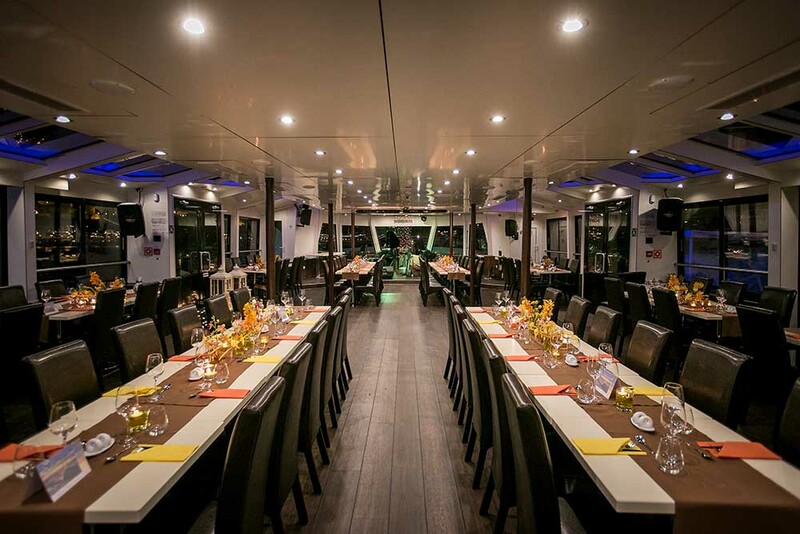 This two level catamaran has a bar, toilet (if needed we have a wheelchair toilet) and the internal spaces provide a comfortable temperature with heating or with air conditioning for any type of event. The outside terrace in the nose allows you to enjoy the views of the Danube and the shore in all directions. Our smaller, but still custom designed ship is also suitable for organizing events on 2 level up to 100 people (60 lower levels, 40 upper levels). 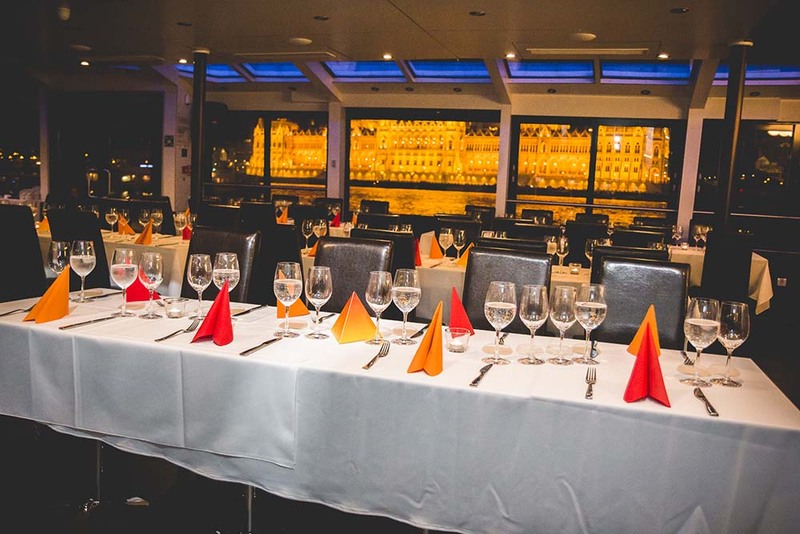 Its upper level is open so you can enjoy the fresh air experience while floating on the river, while its lower floor is perfect for organizing, for example, a fun Budapest team building program or corporate Christmas or even a stag party program. After the complete renovation of our veteran ship, in a state of excellent condition, it is waiting for the guests on board again, whether they want to go for urban or out of town excursions. Margaret Island can handle up to 150 people on 2 levels (100 lower passenger compartments, 50 passenger seats). In the covered cabin below, you can have comfortable events regardless of the weather, while the above cabin allows you to merge with nature during the cruise. Depending on the size of the moat, motorboat renting is available with a captain for up to max. 12 people. This boats can be rented for sightseeing, photography and for any other programmes you like. You also have the opportunity to buy your own motorboat with us. Are you planning to buy a motorboat? You are welcome by our team who will help you from the first steps and will help you to make the right decision. You will also be able to use our port service nationwide, where we will also be able to assist you on request. If any of our vessels or programs have attracted your interest, please contact us for details on any of the following contact details.